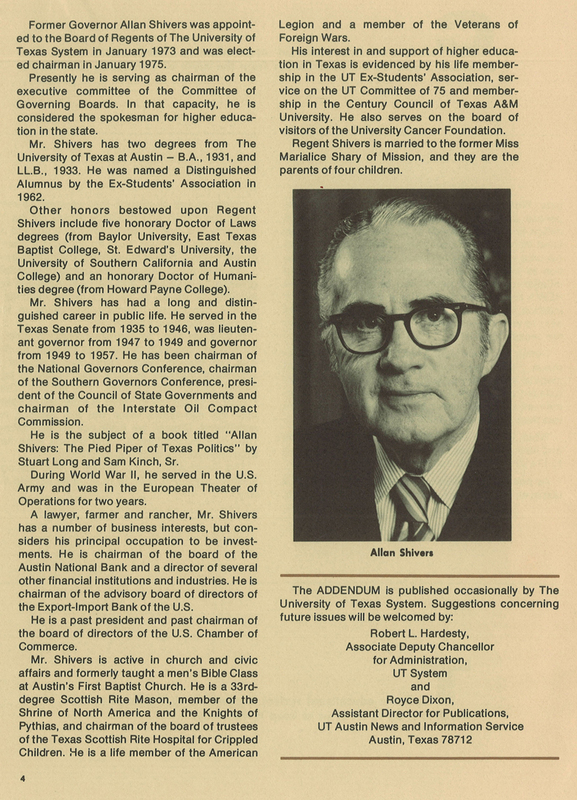 Former Governor Allan Shivers was appointed to the Board of Regents of The University of Texas System in January 1973 and was elected Chairman in January 1975. Presently he is serving as Chairman of the Executive Committee of the Committee of Governing Boards. In that capacity, he is considered the spokesman for higher education in the state. Mr. Shivers has two degrees from The University of Texas at Austin – B.A., 1931, and L.L.B., 1933. He was named a Distinguished Alumnus by the Ex-Students’ Association in 1962. Other honors bestowed upon Regent Shivers include five honorary Doctor of Laws degrees (from Baylor University, East Texas Baptist College, St. Edward’s University, the University of Southern California, and Austin College) and an honorary Doctor of Humanities degree (from Howard Payne College). Mr. Shivers has had a long and distinguished career in public life. He served in the Texas Senate from 1935 to 1946, was Lieutenant Governor from 1947 to 1949 and Governor from 1949 to 1957. He has been Chairman of the National Governors’ Conference, President of the Council of State Governments and Chairman of the Interstate Oil Compact Commission. He is the subject of a book titled “Allan Shivers: the Pied Piper of Texas Politics” by Stuart Long and Sam Kinch, Sr.
During World War II, he served in the U. S. Army and was in the European Theater of Operations for two years. A lawyer, farmer and rancher, Mr. Shivers has a number of business interests, but considers his principal occupation to be investments. He is Chairman of the Board of the Austin National Bank and a director of several other financial institutions and industries. He is Chairman of the Advisory Board of Directors of the Export-Import Bank of the U.S. He is a past president and past chairman of the Board of Directors of the U.S. Chamber of Commerce. Mr. Shivers is active in church and civic affairs and formerly taught a men’s Bible Class at Austin’s First Baptist Church. He is a 33rd degree Scottish Rite Mason, member of the Shrine of North America and the Knights of Pythias, and Chairman of the Board of Trustees of the Texas Scottish Rite Hospital for Crippled Children. He is a life member of the American Legion and a member of the Veterans of Foreign Wars. 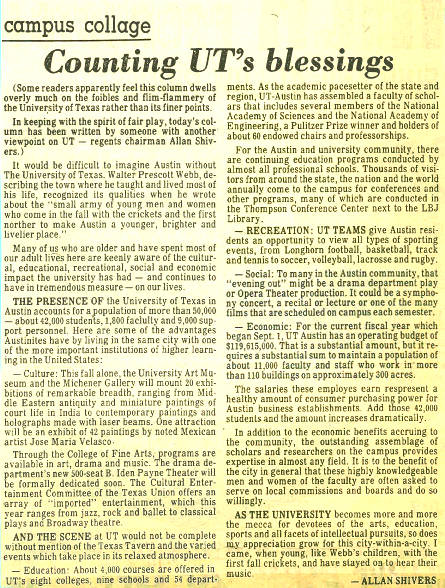 His interest in and support of higher education in Texas is evidenced by his life membership in the UT Ex-Students’ Association, service on the UT Committee of 75 and membership in the Century Council of Texas A&M University. He also serves on the Board of Visitors of the University Cancer Foundation. Regent Shivers is married to the former Miss Marialice Shary of Mission, and they are the parents of four children.